I have to tell you about this storage caddy. This is one of my favorite new things I did with Brinley. I got this before Brinley was born. It is a Trend Lab Storage Caddy. I went in search of it because with my other children, my strategy had been to buy a couple of everything I needed for breastfeeding or to only breastfeed in the exact same place every time. I didn’t want to do either of those this time. I wanted to be able to nurse in multiple locations and be able to easily carry everything I needed with me. So I looked around on Amazon and settled on this one from Trend Lab. It has lots of pockets so it can hold anything I want it to. I can put my Milkie in there when I am done. It holds diapers, wipes, a book, lansinoh, nursing pads, gas drops, diaper cream, bulb syringe, water bottle…It carries it all. I love knowing where things will be–I don’t set it down randomly somewhere and have to hunt it down. I am thinking that when I am done breastfeeding, I will use it for holding crafty items. Then at the hospital, they gave me this one pictured above. Definitely not as good of quality, but I decided to put all of my bathroom items in it for post-baby. This was super handy! I could have all of my stuff out on the counter and easily accessible and have it still be together and organized. I also sometimes showered in a different bathroom soon after Brinley was born, so I was able to just pick this up and take it with me one-handed. I now have it under my sink full of nursing pads. I will definitely hang on to this for holding those feminine hygiene items. So have you tried this? Or something similar? 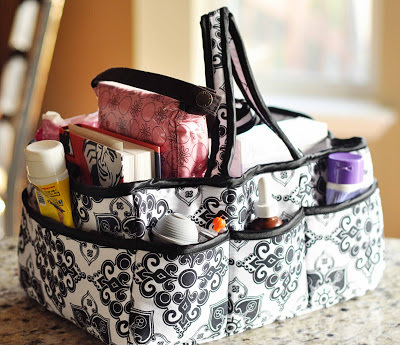 Ah Yes I use the Mini Organizer from Thirty-One! It is sooo great to have everything you need right in one spot! Love it! I have one of these that we originally used when out of town to keep wipes, dipes and various baby items together when visiting relatives. Now we use it in our home for her medicines, syringe, nail clippers,diaper rash cream, etc, so we can easily tote them to different levels of the house. We used the hospital one to organize her socks, headbands, etc in the dresser drawer. I will definitely have to consider nursing in more than one spot for child #2! 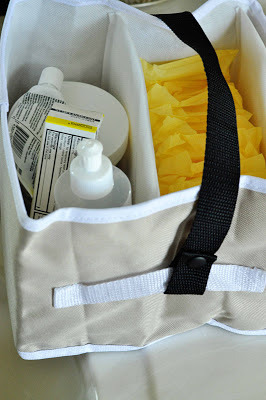 I used the same Trend Labs caddy to make a breastfeeding caddy as a baby shower gift. I used new and used items to fill it up. (new nursing pads, used Hooter Hider etc.) It was such a hit that the person receiving the gift as well as another shower attendee each gave the same gift to other friends having baby showers.